Peptide–synthetic hybrid block copolymers are most easily prepared via ring-opening polymerization of α-amino acid N-carboxyanhydrides using appropriately end-functionalized synthetic polymers as the macroinitiator. This class of peptide–synthetic hybrid block copolymers has been the subject of longstanding scientific interest. First reports on the structure and properties of these hybrid block copolymers date from the 1970s. The advent of more refined analytical tools has spurred the interest in these materials and has led to an increased understanding of their structure and properties. 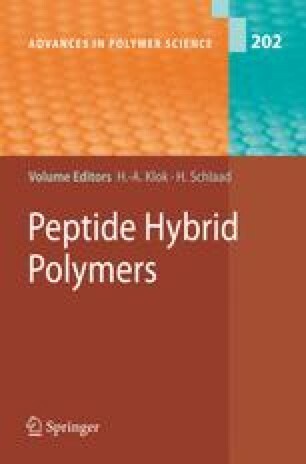 This article presents an overview of the solid-state structure, organization and properties of the major classes of peptide–synthetic hybrid block copolymers, classified according to the chemical composition of the synthetic polymer block. For each of these classes of block copolymers, results from earlier morphological studies will be discussed and compared and complemented with more recent results. Properties and possible applications of peptide–synthetic hybrid block copolymers will also be pointed out.